Four actors playing 130 different characters, can it be done? You bet it can and the cast of The 39 Steps do it marvellously with flair and style keeping the audience enthralled and laughing out loud throughout. Based on John Buchan's novel, Patrick Barlow's glorious farce adaptation embraces the very best of theatre and refuses to to let it take itself too seriously. The cast deftly change character with the tip of a hat, change scenes as characters shimmy through moving doors, roll the set with them and the cast morph into trees, streams, rocks and negate the need for wind machines with ease. The minimalistic stage creates a fabulous theatre within a theatre for the 130 characters to tell their stories. 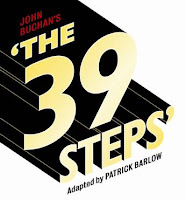 This runaway train of a production very much relies on the talent of the four person cast to deliver and certainly The 39 Steps is in a safe pair of hands with Tony Bell, Richard Ede, Gary Mackay and Charlotte Peters on stage. Collectively they are a tour de force of energy, comedic timing and impeccable delivery. Neither of them miss a beat delivering a masterclass in character creation as they change like chameleons. Richard Ede gives a charismatic performance as Richard Hannay as Hannay navigates the twists and turns of the dark world he has unwittingly been thrust into. Tony Bell and Gary Mackay are positively scene stealing and a delight to watch. Mackay's perfect recitation of Mr Memory's definition of the 39 Steps is an astonishing feat and his portrayal of some of his characters is absolutely hilarious. One of his quick changes resulted in a back to front kilt which would go unnoticed but in Glasgow there was a ripple of laughter and a few pointed fingers. Charlotte Peters is the perfect foil to Ede's Hannay creating three fascinating female characters each with increasingly intensifying chemistry with Hannah. One of the real benefits of seeing The 39 Steps as a Scot in Scotland is the enjoyment of the classic tartan and shortbread interpretation of Scotland and what it means to be Scottish from a local perspective. Playing stereotype bingo only adds to the enjoyment of this superb night out and the Glasgow audience certainly appreciated it. As the play finishes with the plot wrapped up in a neat little bow and snow gently falling on the audience, it's impossible not to leave the theatre with a smile on your face and a warm glow in your heart even as you exit into the frigid Glasgow night. Marvellous.